The benefits of coconut water are vast. The health benefits range from providing daily energy and hydration to long-term prevention of disease and sickness. Coconut water has been drunk for thousands of years, and for some people it is a daily drink. The natives of climate cultures such as Indonesia and the Philippines crack the coconuts open with a machete and drink the water straight from the shell. The ripe age of a coconut is 5 to 7 months. 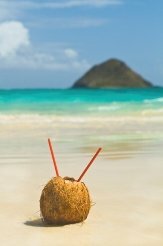 If you try to drink from a coconut before that, the water will be bitter and devoid of most nutrients. After the coconut fully ripens, it will lose most of its free water and will be absorbed by the fruit. The anti-viral, anti-bacterial, and anti-inflammatory properties of coconut water have been used to treat a wide variety of sicknesses. It is a natural isotonic beverage, with the same electrolytic balance that is in our blood. For this reason, many consider coconut water to be the “fluid of life,” so to speak. In fact, during WWII, both sides commonly used coconut water to give emergency plasma transfusions. This beverage has been used to regulate blood pressure, blood sugar, and cholesterol levels in the body. It has also been found effective in treating stomach flu, indigestion, dysentery, indigestion, constipation, intestinal worms, cholera, kidney malfunctions, age spots, wrinkles and dry, itchy skin. It is also a great source of energy and nutrition. Drinking coconut water is a smart alternative to drinking plain water or juice on a hot day. It is packed with minerals, electrolytes, and simple sugars to help rehydrate the body. A 100 ml serving (about 1/3 cup) of coconut water offers 250 mg of potassium and 105 mg of sodium. These minerals are essential for your body and its energy levels. When these mineral levels drop, your energy drops, as well as your hydration levels. Despite its light consistency, the coconut water has a better composition of minerals than of some basic fruits like oranges. If you compare the mineral benefits of coconut water to a replenishing drink such as Gatorade, you will find that coconut water has much more potassium but falls short in sodium. This makes it a great alternative to a soda or juice, but should not replace a high-electrolyte recovery drink, such as electrolyte enhanced water when working out or during heavy exercise. Coconut water is also packed with vitamins and other nutrients. It has high levels of complex B vitamins such as riboflavin, niacin, thiamin, pyridoxine, and folates. These vitamins are essential for your general well-being and are important to replenish because your body can only get them from outside sources. Coconut water has a small source of vitamin C as well, roughly 2.4 mcg per serving. One of the unique benefits of coconut water is its abundance of cytokinins, such as kinetin and trans-zeatin. Researchers have found that cytokinins are plant hormones that help regulate cell growth and cell division. Cytokinins are especially hard to find in nature and are usually only made synthetically by separating elements from plants such as corn. Coconut water contains these cytokinins as well as lauric acid, which can minimize the aging of skin cells, balance pH levels, and keep the connective tissues strong and hydrated. Therefore, simply applying coconut water topically onto affected skin areas every night before going to bed may help with acne, age spots, wrinkles, stretch marks, cellulite and eczema. The many nutritional properties of coconut water make it an exceptional health drink during any season or climate. It can benefit anyone, including pregnant women and small children, and has virtually no known side effects. You will receive the highest levels of minerals and nutrients if you can drink it straight from a fresh coconut. However, if you don't happen to live in the tropics . . . there are a variety of canned and packaged products that offer many of the beneficial nutrients in coconut water, such as the Vita Coco or Taste Nirvana brands. Read coconut water reviews or BUY now. PubMed.com; Analysis of Some Cytokinins in Coconut; 2004.